Recent reports have noted the embarrassing inability of Google's "Featured Snippets" to correctly answer basic financial questions based on simple math, or the propensity of Google Home to confidently provide ridiculous answers that are based on outdated, failed prophecies of conspiracy theorists recorded in the fringe section of its YouTube library of videos. 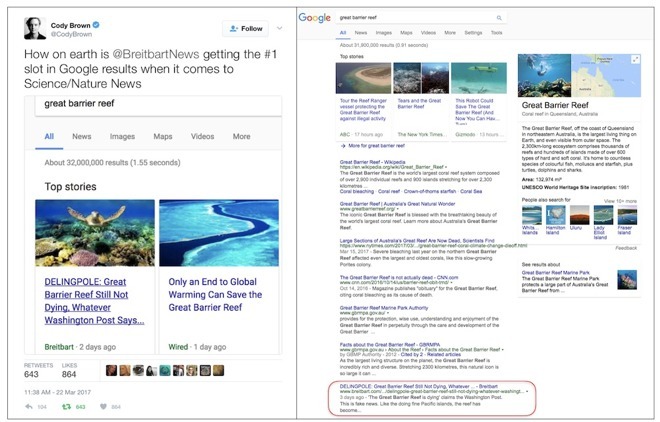 Most recently, Google's search results for a nature subject ("Great Barrier Reef") were found to be prominently linking to a factually false political column posted by Breitbart, which rather than offering any actual information, simply opines without any supporting logic that "we have got to the point where a large fraction of the science we see cannot be relied upon." A day later, the "story" still appears in Google's top ten search results for "Great Barrier Reef," like Wikipedia vandalism slowly moving downward in an article rather than being removed by a human editor. The reason Google links to a fringe political site for science-related search results appears to be due only to the fact that Google approved the entire site as a source of news in general, dramatically increasing the site's visibility and putting it on an equal standing with legitimate publishers in every subject. It now appears Google has given up on its original mission, and now simply presents all information as equal regardless of its value or usefulness. Without human curation, and with the currently unimpressive ability of AI to distinguish between informative fact and low-value bloggeria, Google is devaluing its search results. 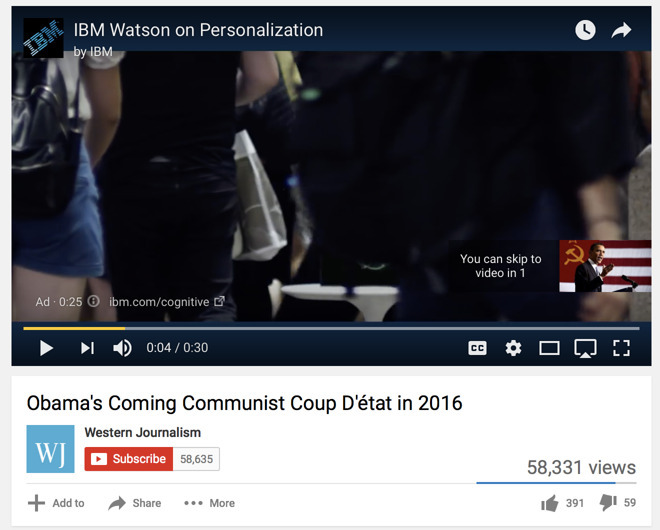 This is also resulting in blowback from many of Google's primary customers: its advertisers. By associating the brands of its customers with extremist videos and disturbing content, it is creating a brand crisis that's causing major ad buyers to pull their advertising dollars from Google, its network of web ads and its YouTube property. That shift began in the U.K. and most recently has erupted in the U.S., costing Google hundreds of millions of dollars while erasing its leverage to maintain control over how ads are placed. As Google is forced to relinquish more pricing power and placement flexibility to its advertisers, it not only will become less profitable but also less competitive with other ad network competitors who can better target their audiences and promise less brand-embarrassment to ad buyers. Google tries to better train its AI with human "quality raters"
"Quality raters do not have the power to alter Google's results directly," the report noted. "Instead, the data produced by quality raters is used to improve Google's search algorithms generally. In time, that data might have an impact on low-quality pages that are spotted by raters, as well as on others that weren't reviewed." Google has been making some progress, particularly in cases where its false results have generated outrage. However, the vast scope of the information available on the web makes Google's task unbounded and essentially infinite. Unless it can figure out how to strike a better balance, Google may lose too much advertising revenue to continue its incremental "putting out fires" approach to fake news and false search results. That may require finding a new business model outside of paid placement search on the desktop, which the company still relies upon for the majority of its revenues. 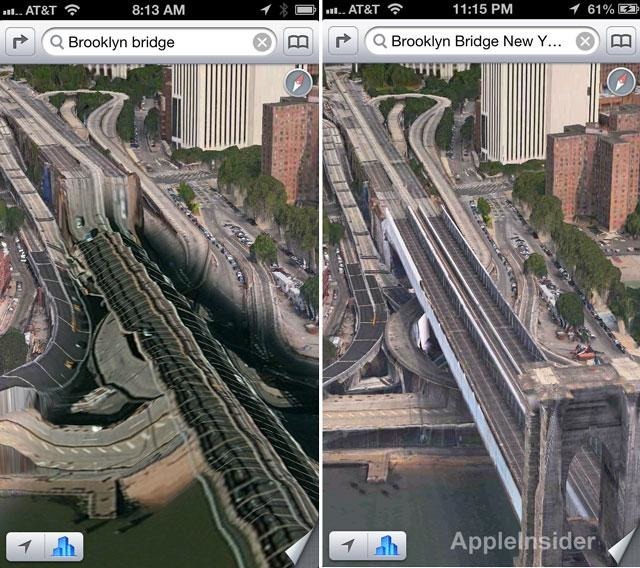 Google's false answers and fake news results bring to mind the critical reception of Apple's iOS 6 Maps, which were lambasted for depicting 3D images of twisted piles of aerial highways and distorted buildings, as well as providing incorrect or incomplete directions and locations, an issue Google itself exaggerated and promoted even as its own Google Maps provided outdated, incorrect or even illegal directions itself. Unless it better manages its crisis of information organization and brand safety, Google could find itself in the position of Microsoft in the days of Windows Vista: highly vulnerable to new competition just as the computing landscape shifts dramatically. Voice-based search has gained escalated attention in the era of Siri and Alexa, and Google's own assistant not only doesn't work across all Android devices, but is also being aggressively challenged by Google's primary Android partner, Samsung, which now has its own voice search system to promote. Outside of voice, Apple's iOS platform has also increasingly promoted universal search of the web and deep search of data within apps, with increasing ties to alternative search engines outside of Google's results.